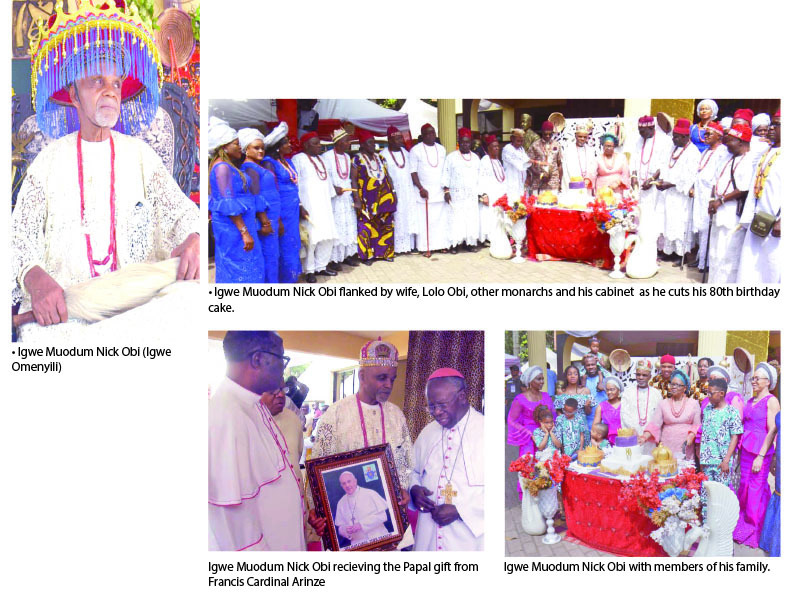 It was a triple celebration for the people of Nnobi community in Idemili South local government of Anambra State as they recently celebrated the fifth Ofala of their traditional ruler, Igwe Muodum Nick Obi (Igwe Omenyili), his 80th birthday and the restoration of peace in the land. Sure, the ceremony had all the trappings of a high class and culturally enriched festival to the admiration of all who were in attendance. For Igwe Obi, who is the first Nigerian Chattered Gas Engineer, the celebration was one that he would not afford to postpone or ignore, especially as it gave him the opportunity to thank God for legal victories and heralds the return of peace to the community, which, for some years, had gone through litigations that threatened the peaceful administration of the land. No wonder he had to start the whole event in humility in the presence of God a thanksgiving/ Eucharistic Mass at St Mary’s Catholic Church, Awuda, Nnobi and which was officiated by no less a Priest than the former Prefect of the Congregation for Divine Worship and the Discipline of the Sacrament in Rome, Francis Cardinal Arinze, supported by other clergy and religious. The ceremony proceeded from the church to the palace where the monarch, Igwe Obi in his full white regalia sat on his throne and was flanked by his wife, Lolo Clara Obi and over 50 cabinet chiefs who were also clad in full white regalia with red cap and other traditional insignia to match. The epoch making event attracted people from all walks of live across the globe. Various traditional groups, stakeholders and individuals were represented as they take turns to pay homage and present gifts to the monarch. Adding more glamour to the colourful event was the presence of many traditional rulers from various communities led by the Chairman, Anambra State Traditional Rulers Council and Obi of Onitsha, Igwe Alfred Nnaemeka Achebe (Agbogidi) and government functionaries, captains of industries and politicians. There was also cultural dance display including the famous ‘Ufie’ dance which only monarchs and red cap chiefs are qualified to dance in Igbo land. Masquerades of various kinds were also handy to entertain the audience. Igwe Obi at the ceremony honoured some sons and daughters of Nnobi town that made impact in the development of the community. Some of the Nnobi icons honoured include the state Commissioner for Basic Education, Prof. Kate Azuka Omenugha and a US-based renowned Surgeon, Prof. Ferdinand Ofodile. Others are Chief Okpala Chukwunonso, Rudolf Okonkwo, Lady Grace Ezenwa and posthumous recognition to Late Justice Moses Okechukwu while a centenarian, Pa Levi Chibuzo Okpala aged 103 was also honoured for gift of longevity. Taking a brief look at his community, his years on throne and challenges Igwe Obi said, “Nnobi is regarded as ‘Ana nso.’ Nnobi is the capital of Idemili. Idemili shrine is originally based in Nnobi and of all the towns in Idemili North and South, Nnobi is the headquarters of the shrine and then in Nnobi, like most towns that have Idemili, we revere the python. Not the python 2 of python 3 but the original python. We revere it. In fact, up to Awo Idemili in Imo State and other places, we don’t kill the python. So, personally, I’m a man of peace. I believe in peace. I believe in due process and the rule of law. We have our challenges but we have tried to manage it using the rule of law and then going to court, hence; did I mention, I got the court victory? From 2001 to 2008, the court gave me victory. “Before then, there were two other cases which also were in my favour. Nnobi like most town in Igbo land, particularly in Anambra; I have said earlier about the term, Igboenweze. In fact, we the Igwes are troubled about that term, Igboenweze. People are misconstruing it and because of that, every small thing, people will go to court and sue and because of the freedom of association, freedom of worship and so on, people tend to go to court at the flimsiest excuse. So, the first court, somebody just woke up and said, I am the Igwe-Elect. So, the town took him to court and the court gave an interlocutory injunction and said you cannot address yourself as the Igwe-Elect. His name is Mr. E. Ejudo. You cannot address yourself, you cannot be addressed and you cannot allow anybody to address you as such. “The second one, he also went to court himself. He then became the plaintiff and the court said no; there are three quarters in Nnobi; Ebenesii, Ngo and Awuda. This is an autonomous community issue; a section of Nnobi which is my own quarter; some individuals’ tried to have autonomous status which was rejected by the government of Ngige. Then, later, the law, section of the autonomous status was repelled by the Anambra State House of Assembly. They went to court. Anambra State High Court said that there was an autonomous law. Then the government against went to Court of Appeal and Court of Appeal in 2011 ruled/ gave a judgment that there was no autonomous communities in Anambra State. In fact, Anambra, unlike our neighbours; Imo, Enugu and possibly Ebonyi, I’m not so sure, they are not keen in autonomous because it creates a lot of problems. I have mentioned two cases now. The President General of Nnobi, Dr. Edokobi Samuel Ofodile who was elated at the success of the ofala said, “By our constitution, this ofala is organized by the community together with Igwe. The 80 year celebration which our Igwe marks today is being celebrated by Igwe and other octogenarians from the community who have attained same age and hence forth, we shall make this an annual event where we celebrate our people who have attained the age of 80. So, we expect them from henceforth to play elderly and advisory role for the good of the town.